Hotshot firefighters use conduct burnout operations on the 416 Fire on Tuesday by using plastic sphere dispensers to start fires on the ground in areas that are inaccessible to fire crews. 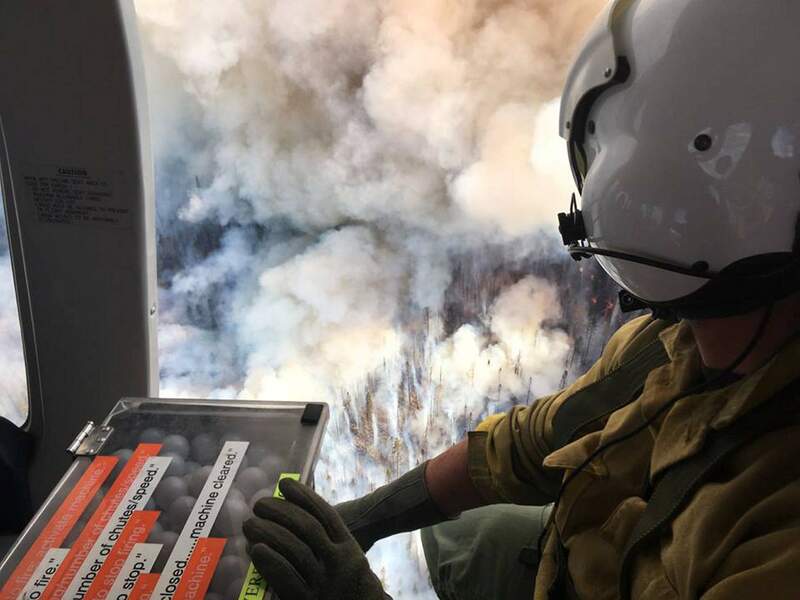 The 416 Fire grew more than 200 acres Tuesday, and its increased intensity and activity were a result of high temperatures, low humidity and strong winds, fire officials said Tuesday night. The weather forecast won’t help much. 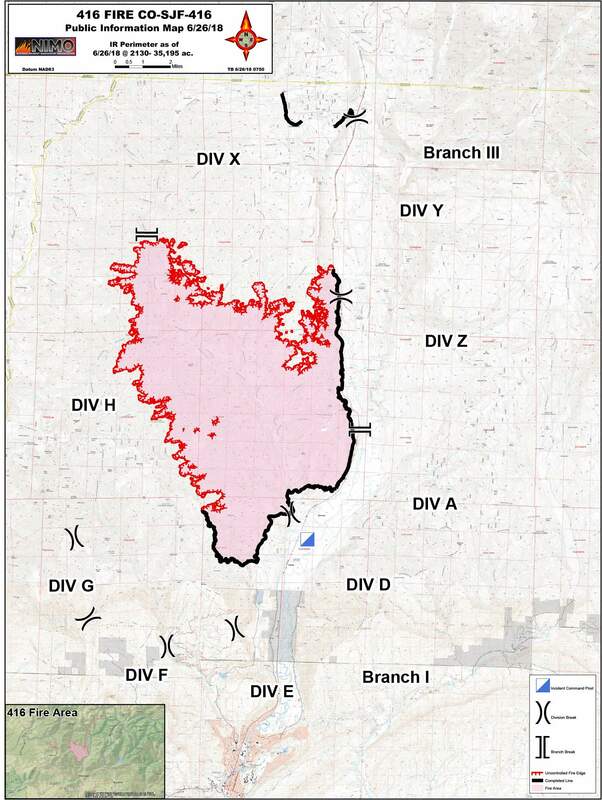 The temperature Tuesday night was expected to be in the 50s, but the with such low relative humidity, fire officials expected an increased potential for the fire to grow Wednesday. The Durango area may see an increase in smoke over the next several days as fire crews conduct burnout operations on the southwestern perimeter of the 416 Fire, officials say. The burnouts, combined with a rise in temperatures, decreased relative humidity and accompanying downslope winds, could lead to an increase in fire activity. 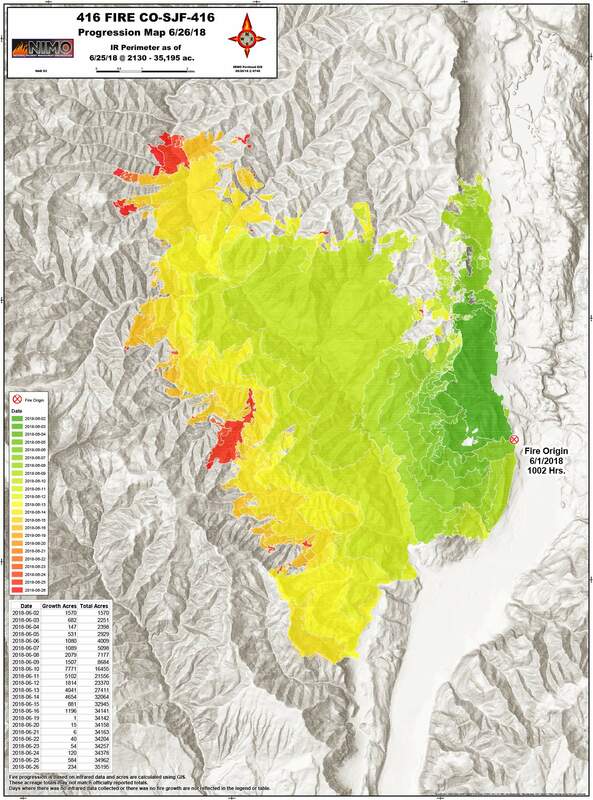 Downslope winds were forecast to continue through Tuesday night, increasing smoke levels in the Durango area. Smoke from Tuesday’s fire activity was expected to drain southward along the Animas River and produce moderate to heavy smoke Wednesday morning, according to a news release from San Juan Basin Public Health. Heavy smoke was observed throughout La Plata County on Tuesday, particularly along the Animas River from the 416 Fire southward to the New Mexico line. Kliste said there’s a chance that Silverton could be hit with smoke as early as Friday as forecasters predict a change in wind direction. Air quality monitors – one at the health department’s office in South Durango and one in North Durango – have been set up to show the amount of particles in the air, which can cause respiratory problems. The monitors display real-time concentration of particulates, but the health department advises using the 24-hour average for health recommendations, the official standards set by the U.S. Environmental Protection Agency. Kliste said that though the smoke levels are worrisome, he doesn’t expect the hazardous levels experienced during the first few days of the fire. “People will wake up and smell smoke and see smoke, but I don’t think you’re going to see anything on that scale,” he said. Fire officials will continue to conduct burnouts over the next several days, depending on weather conditions. The burnouts are used to build containment lines in preparation for the monsoon that should come in mid-July, Kliste said. The fire, which started June 1, was at 35,195 acres and 36 percent contained Tuesday morning. It grew 234 acres Tuesday. The containment number dropped 1 percent. No containment lines have been broken, and the fire hasn’t increased at a level that would warrant the change. The number was confirmed through more accurate mapping, Kliste said.